I really and truly didn’t come to the show only to buy things….but….. I have some size 10 but I like to have a variety of sizes so size nine is good. Yesterday I got a tote bag and that small purchase seemed a bit lonely in that big bag…so I found something I can always use to help fill it up…25 fat quarters of 30’s reproduction fabric. They had the fabric bundled like this to go with a pattern they had for sale, I think I will modify that because I am not a fan of following a pattern…I like to change it up and make it my own. Yesterday I looked for a wooden quilting hoop (I want better quality than the 4 dollar craft store kind)…I didn’t find one…I found this instead. It came from Jean S Lyle www.jslyle.com…they also had singer 221 machines and 221 sewing tables…at great prices. 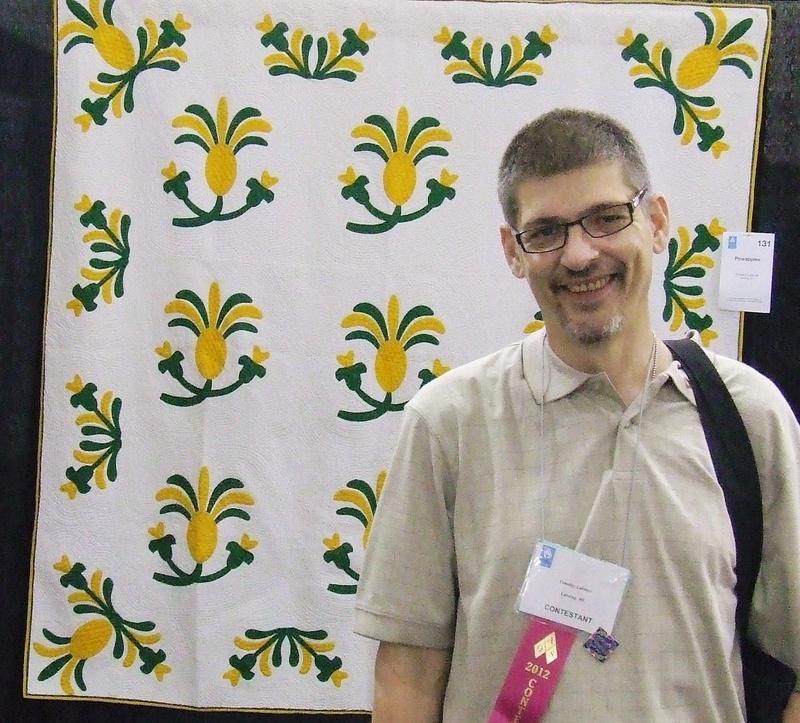 People have told me that they looked for me at the show and didn’t find me..so here is a picture of me at my quilt…. It is so nice to meet you! Enjoy the show! Looks like you are having fun! Funny, I bought a tote also last time I went to a show and I felt like I had to fill it too!!! I don’t think it is a mistake they they sell big tote bags at the shows!! 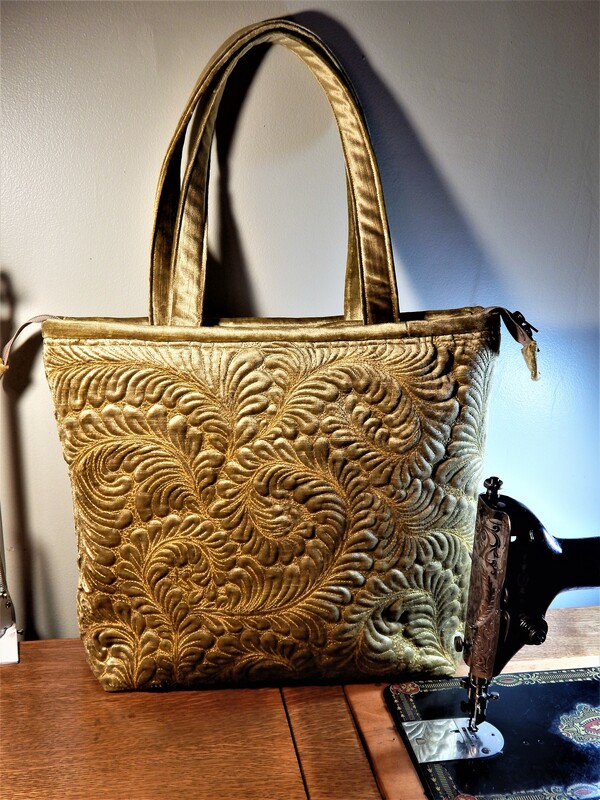 Obviously you have not been to enough quilt shows to know that when you buy a tote or they GIVE you one, the rule is you have the obligation to FILL IT UP! It’s the RULES! And I always go by the rules! Glad I followed the rules!…..but I can only afford to follow it once!! Yes, I certainly will. Not sure when I will get to mine, but am hoping to this fall some time!! me too! 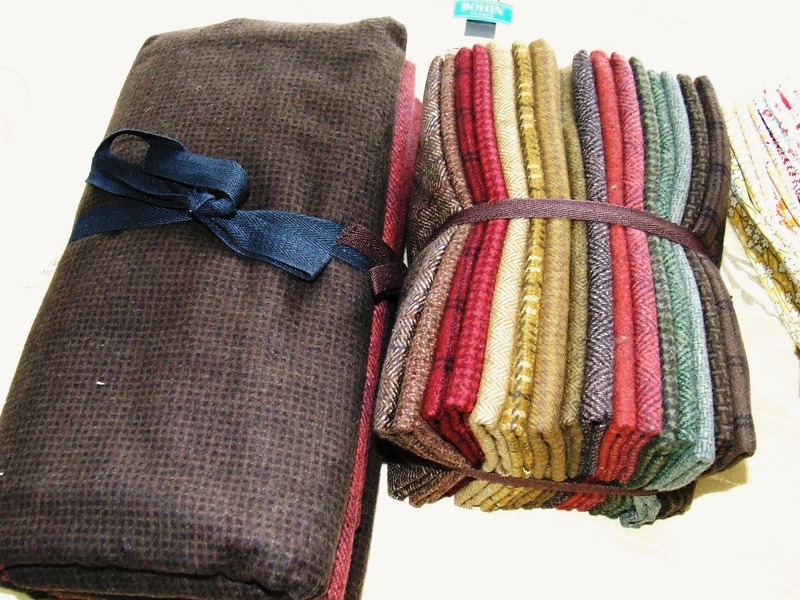 would be nieh to have a soft warm flannel quilt for fall!! That’s wool flannel, isn’t it? Not cotton flannel? 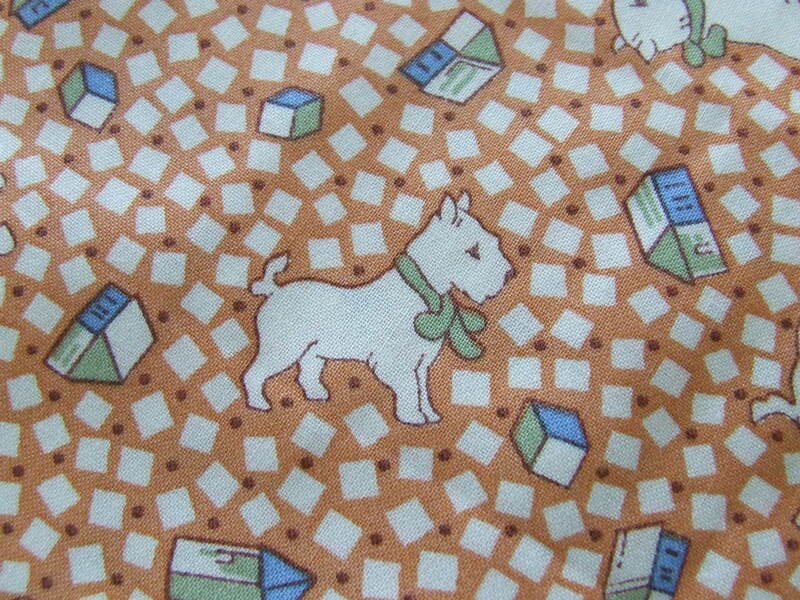 Nice to see there are people out there that can’t resist fabric and the other goodies that go with quilting. Sounds like a lot of good bargoons to be had. Sounds like you’re having fun too. Good to see you. It’s always nice when one can put a face to a name – and to their work. it is cotton…and very soft! and I do love to buy new goodies!! I am drooling over all your goodies. What fun!! Can’t wait to see what the new fabric gets made into. That flannel looks scrumptious. I can almost feel it, even from Maine. Tim, Do you know that you look like a lot of other guys! Tall, thin and glasses but the smile on your face says it all. Nice to meet you altho’ I live about 1000 miles away. Please keep us posted about your new quilt frame! I am also looking for something different than my little hoop. 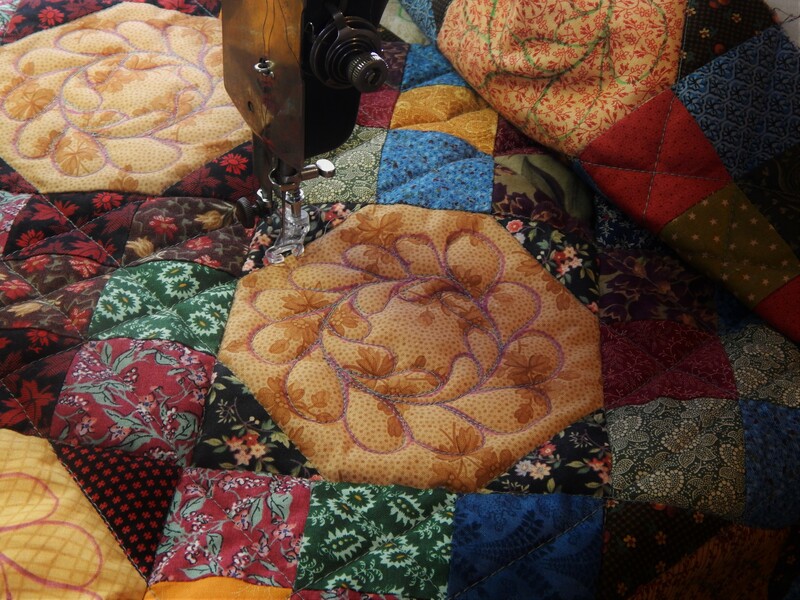 I will do that….as soon as I get home I am going to get a quilt in it and try it out! !…I am kicking myself for not bringing one to the show with me to work on!!! That is a beautiful quilt frame! Absolutely gorgeous. Flannel too, I have the same thing planned for a special someone’s Christmas gift. Nice to meet you btw. Hey…. I know that guy! Glad you spent some of your $$ on some fun stuff. I hope to do the same tomorrow! 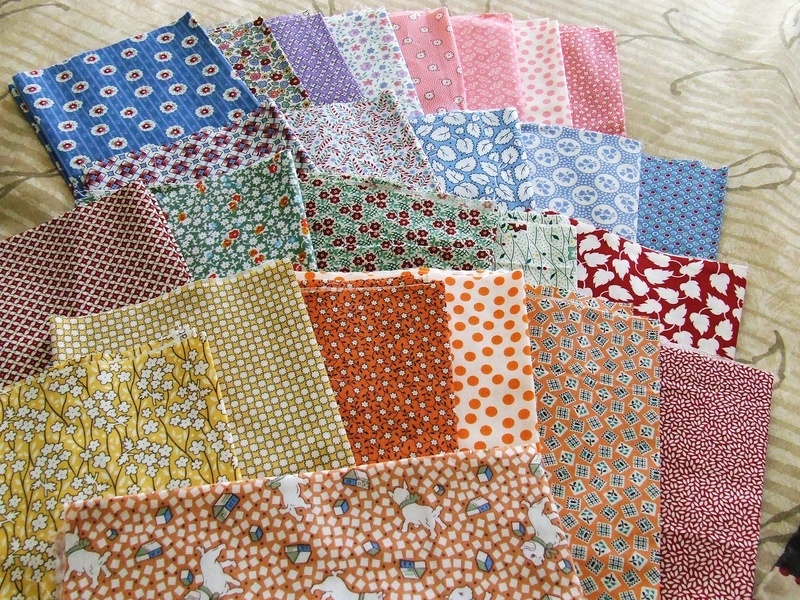 LOL – you can’t go to a quilt show and not come home without making at least a little bit of purchases! I always take home more than I intend to or need 🙂 love that quilting hoop with the stand. I say that I am done buying now but tomorrow might be a different story! I am not sure if they can be ordered on line or not…I didn’t get a website address…but I will for sure let you know how it works! I have a floor quilt frame similar to the one you just bought and absolutely love it. Bought it years ago and it is seldom empty. I also use a Q-snap frame because I drag them all over the house. Frame hoop is in front of the TV and the Q-snap is usually on the porch in the summer. 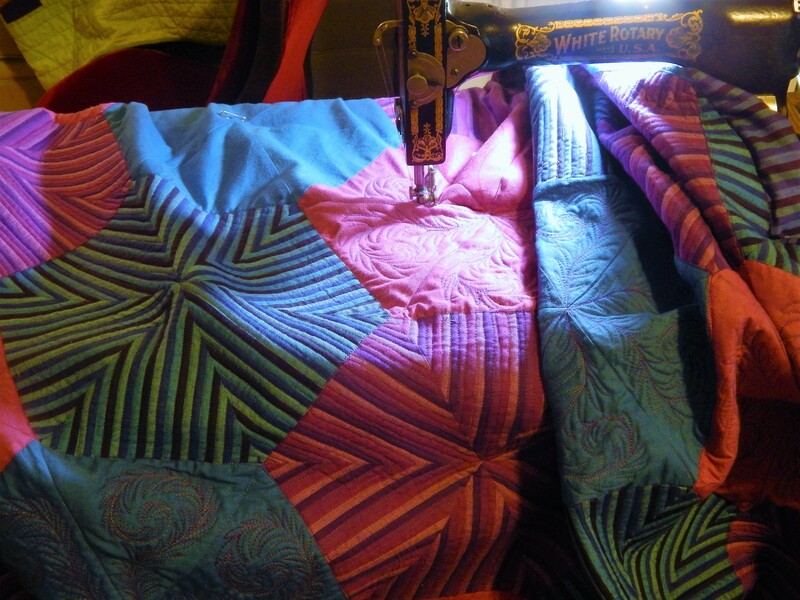 Always work on more than one quilt at a time. I like options! Oh man… I didn’t know there would be so much cool stuff for sale…. I’m going to pick me up these needles and maybe a new style thimble, at least! you are going to love it!…but be prepared for a crowd!! the boots are small and everyone want to get in an look!! 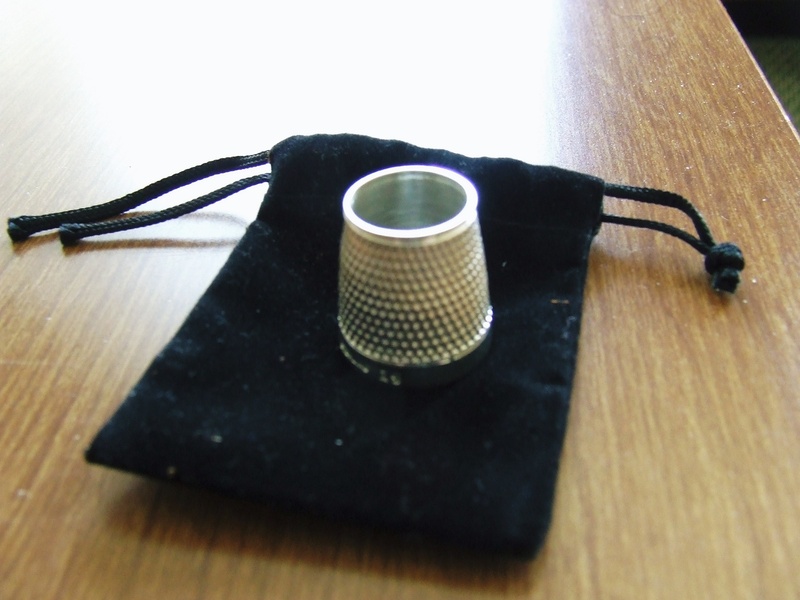 Thanks so much for the info on the thimble! The Lyle website was having problems tonight, so I’ll be on the lookout for it soon. (going to a show in PA in a couple of weeks) Aren’t the BOHIN needles THE BEST? I love them for appliqué…the #12s are so thin, they just glide through the fabric. Your new hoop looks wonderful…very sturdy. You have great finds!…and, good to meet you, too! Be careful….we all know what you look like now! great!…I know that the PA show is going to be amazing…just be careful not to buy everything in site like I feel I am doing! I’ve never seen the Bohin needles here, but I am going to look for them at our Creativ Festival in October. If you recommend them for hand quilting, they must be fabulous! 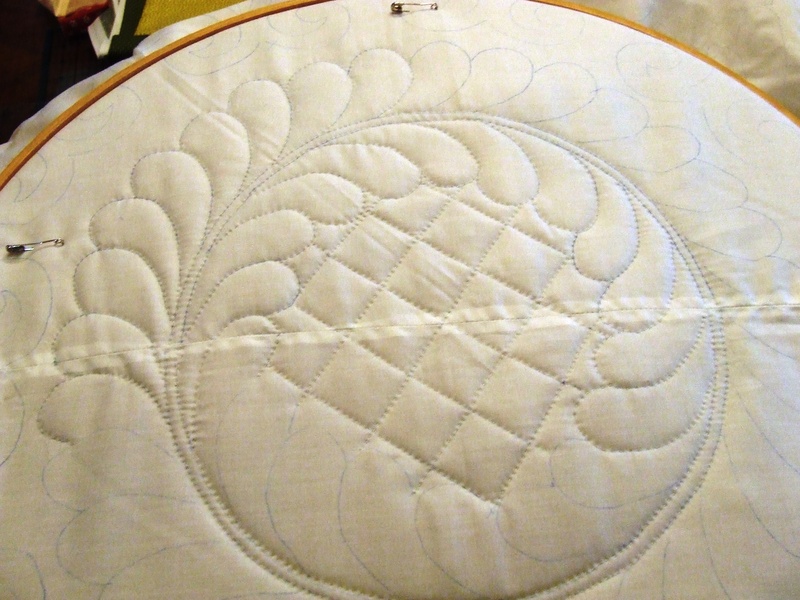 Love the quilt hoop you found – it looks like you’ll get a lot of use out of it. 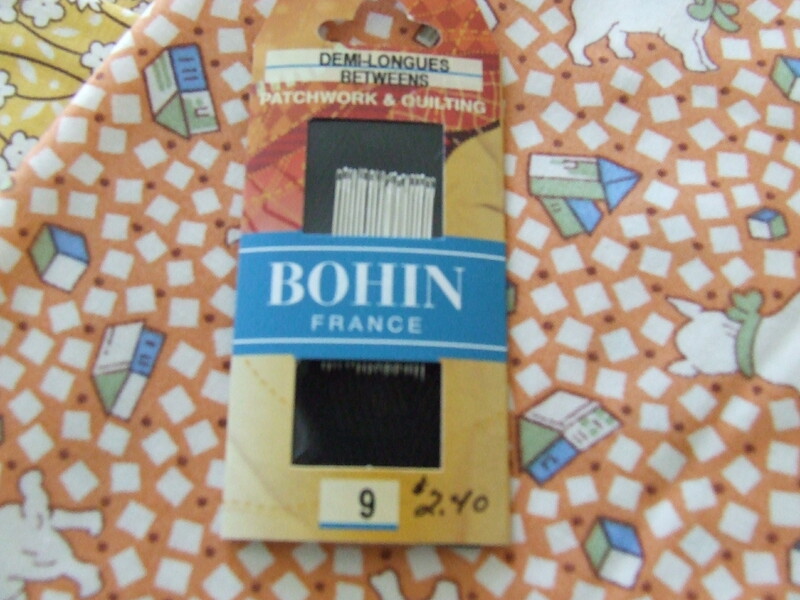 I have never seen Bohin needles but will look for them now. 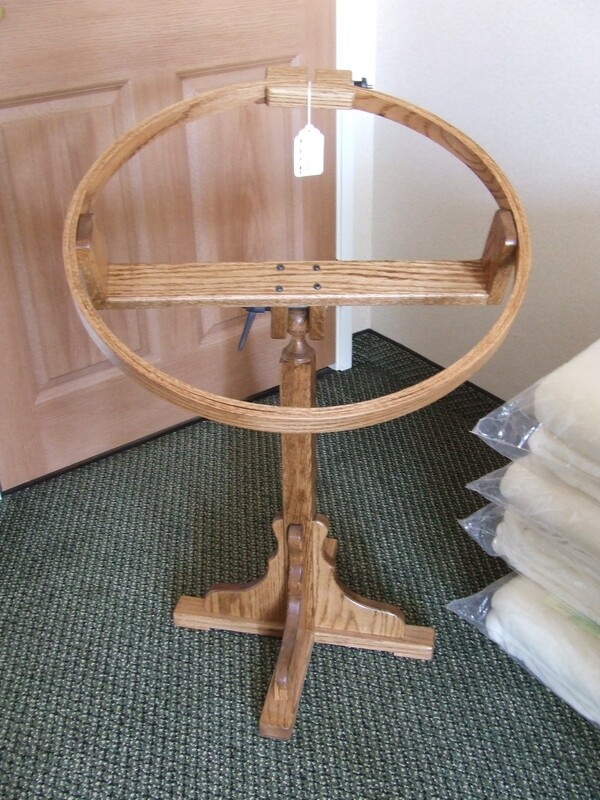 I have my mothers quilting hoop which she always used propped up on the kitchen table. I have a hard time using it because I do not have a good place to prop it up. Your new quilt frame looks great with its own stand. I hope you post a picture for us when you start using it! I will post some pictures…I can hardly wait to give it a test drive! That’s YOU??? Why I had you pictured with longer flowing locks, perhaps a ponytail!!! HA! LOL…I can’t imagine myself with long hair!